It's really starting to get cold now. I have the heater turned on for most of the night. Today, my afternoon tea came in a cute Donald Duck package, so I was going to post a picture of it. But Disney's copyrights are really strict, so I decided against it. Too bad... I kinda wanted to. By the way, the... lemon tea? - it was yellow - was Pooh. Speaking of afternoon tea, this was over a decade ago, but I once saw an old man at a convenience store who came up to a clerk with some afternoon tea and asked "Can I drink this in the morning, too?" And it stuck with me all these years. "So there are people like that...", I thought at the time. It makes me laugh whenever I start to think about it. On a completely different topic, I tried for an autumn-esque front page image. 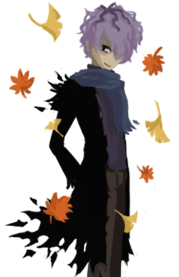 It definitely felt lonely without anything up there, so you get scarf Garry. This time I attempted to tackle my greatest weakness: warm colors. I'm profoundly terrible at drawing lines on a computer.